Islamabad- -stan Air Force observed 7 September as Martyrs’ Day at all PAF Bases throughout the country today. 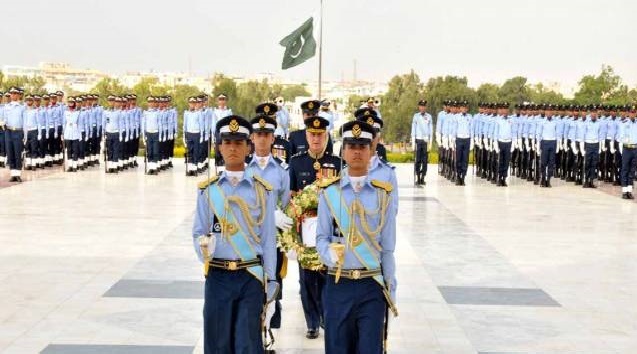 A ceremony was also held at Air Headquarters Islamabad, in which Air Chief Marshal Tahir Rafique -, Chief of the Air Staff, -stan Air Force, laid floral wreath and offered “Fateha” at the Martyrs’ Monument. Prin-l Staff Officers and a large number of Airmen attended the ceremony. The day started with special Du’aa and Quran Khawani for the Shuhada of 1965 and 1971 wars and those who laid down their lives in action since creation of -stan. A similar ceremony was held at Karachi, where a PAF contingent led by Air Vice Marshal Azhar Hasan Rizvi, Air Officer Commanding, Southern Air Command offered “Fateha” and laid floral wreath at the grave of Pilot Officer Rashid Minhas Shaheed (Nishan-e- Haider) on behalf of Chief of the Air Staff, -stan Air Force. Floral wreaths were also laid on the graves of PAF Shuhada throughout the country.